The only thing better than eating chocolate must be eating chocolate in Brussels, the praline and truffle capital of the world! With a like-minded (and chocoholic) local by your side, stroll through the city and visit the most renowned chocolate boutiques, sampling these delicacies along the way. You'll see the most iconic landmarks en route, but the highlight of course will be indulging in Brussel's world famous chocolate! Along the way you'll learn how chocolate is made, the city's own chocolate making history and the culinary magic that's behind the city's delicious cocoa creations. 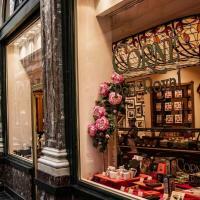 Visit the oldest chocolate shop in Brussels and taste their renowned pralines, discovering where Brussel's reputation for being home to the world's leading chocolatiers comes from, and hearing the story behind the local creation of the praline. 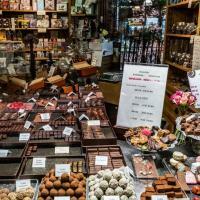 Learn how chocolate is made and the art form that is praline and truffle making in Brussels - your local and the chocolatiers who's shops you'll visit will explain how the humble cocoa bean is transformed into delicacies you'll be sampling. As well as tasting the traditional, for local will also take you to chocolate boutiques where you can sample innovative twists on the classic truffle like chilli or hibiscus, and of course buy some to take home with you! We’ll be in touch within 24 hours after booking to find out more about your personalities and interests so we can assign a like-minded local who can create a bespoke experience for you. Although you will see the main attractions in a specific area, your Local Host will also help you to discover the places, things and stories that you won’t find in a guidebook and that make the city unique. 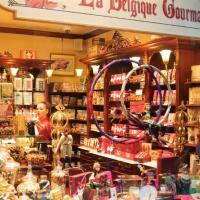 * Join a local to enjoy eating your way around Brussel's best chocolate shops! We had the most remarkable family tour with Mr. Milton. Not only everything was perfect, but we felt, in every instance, that our guides truly cared about us, both the kids and adults, and did his best to make this trip memorable. He did his best to make the tour funny and organized. The tour program was scheduled well and definitely would recommend it to other families. Phenomenal tour! I don’t usually take tours but since I was travelling solo for business and wanted to see the city and try the amazing Belgian chocolate I decided to give this a try. It surpassed my expectations. You get to try a lot of chocolate. Well worth the money. Theresa was our guide and she was outstanding. Her energy and enthusiasm really made the tour so amazing. 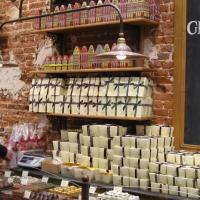 Tons of fun facts and stories about the city mixed with delicious chocolate. Book this now! This tour was an amazing present from my boyfriend. I had a great time and throughly enjoyed the chocolate experience. We kicked off the tour with a delicious ice-cream and tasted various kinds of chocolates throughout. Eventhough i though I was a chocoholic, I certainly learned a lot new about tasting chocolates, the regions where it grows and the different flavours this gives to chocolate. We also had a chance to taste some unusual flavours such as toasted pecan. I would recommed this tour to everyone who loves chocolate, and guys - if your girlfriend loves chocolate - this is the perfect gift for her!